After all the hard work and energy our team put into the Cydcor Day of Smiles event, we were ready for some fun and games! Our team recently got to let loose a little at our Cydcor Night Out. Games, sunshine and smoothies were found at our gathering. At Cydcor, team member happiness is important to us. We want to make sure our team is engaged, developed and feels a sense of purpose. Sometimes that means having fun too. 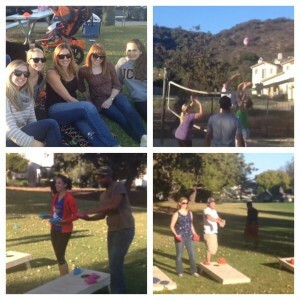 Team members played volley ball in the sand and rounds of corn hole. The outing took place outside near the Cydcor office in Westlake Village, California. We are currently hiring at our home office. Click here to see our Cydcor Jobs Page.